The knee is made up of bones, cartilage, and ligaments. It is one of the most important joints that is used to support the entire weight of the body while performing a host of other activities. While the bones give the knees the necessary strength to bear the weight of the body besides bending them, the muscles give it the necessary tug to straighten and support the joints. The tendons connect the bones to the surrounding muscles, while the ligaments connect the primary bones to other bones. If you experience pain in your knees every time you bend with no improvement over time, then it warrants a visit to the doctor. Learn how you can manage your knee pain with the help of some simple measures and a few exercises, through this article. If you have an arthritic knee then you might have Osteoarthritis, Rheumatoid Arthritis or Post-traumatic Arthritis that is causing your knee pain when bending. Visit orthoinfo to learn more about the 3 forms of arthritis in the knee. Relief Tip - Lifestyle modification, light exercise and bracing will reduce pain. However, contact your doctor for specific treatment to reduce, allieve and eliminate pain. The bursa is a sac filled with lubricating fluid that acts as a cushion between bones, tendons, joints and muscles. It usually gets inflamed by overusing in sports or kneeling for extended periods of time. Relief Tip - Rest, wrapping and elevate your knee. The meniscus is a crescent shaped disc that pads your knee. A meniscus tear is a common knee injury that is usually caused by a hard twisting or quick turning motion. Relief Tip – For minor or moderate tears try rest, ice, knee compression and elevation. For a severe tear contact your doctor. Along with the above, surgery and physical therapy might be advised. There are 4 ligaments in the knee that can get injured. 1. Anterior Cruciate Ligament (ACL) stabilizes front-back knee movements & can be sprained or torn if the knee is hyperextended, twisted or bent. It’s a common sports injury that occurs when there is a hard stop or twisting of the knee. 2. Posterior Cruciate Ligament (PCL) also stabilizes front-back knee movements & is an injury that’s the least common in the 4 ligaments. 3. Medial Collateral Ligament (MCL) supports side to side movements & can become injured when there’s a pushing force on the outside of the knee inward. 4. Lateral Collateral Ligament (LCL) also supports side to side movements and can become injured when there is a pushing force on the inside of the knee outward. Twisting, jumping and stopping suddenly when running can cause ligament injuries. In addition, shifting weight from one leg to another will aggravate your knee pain when bending. Relief Tip - For mild to moderate injuries rest, ice and elevate your knee. You can also take NSAID’s to relieve some of the pain. However, if the pain is severe or doesn’t go away after applying the above methods contact your medical professional. 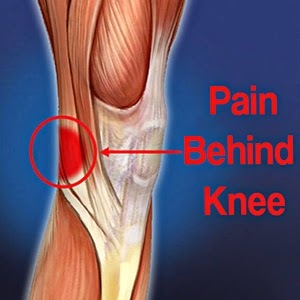 Jumper’s knee or Runner’s Knee (Patellar Tendonitis) is an inflammation or injury of the patellar tendon, the cord-like tissue that connects the kneecap (patella) to the shinbone (tibia). This type of knee injury is one of the most common injuries found in young active kids, runner’s or athletes. Relief Tip – For minor to moderate injuries use the RICE treatment (rest, ice, compress & elevate). Also NSAID’s will help you relieve pain. For a severe jumper’s knee injury explore massage therapy options. In addition, physical therapy and specialized injections to desensitize the nerve endings might need be advised. Contact your doctor if you feel your injury is severe.